Click these thumbnails for enlarged views of the Suspending Memory proposal. This design covers the memorial site with a pool. Two islands are located where the Twin towers stood. Trees and glass columns are spread across the islands, which are connected by a bridge of stone and glass. Each glass column is different, giving a biography of the victim it represents. The columns are lit at night. A stone wall on the northern island contains 2982 polished squares, and separates the island from its surroundings. Water descends from each square into a reflecting pool. Joseph Karadin moved to New York City in 1997, and works as a designer in Manhattan. Hsin-Yi Wu was born in Taiwan, and moved to the United States in 1992. Both studied architecture at Cornell University. "The memorial at the World Trade Center site gives the victim's family members a chance to tell the story of the ones that they have lost. It will give each and every person who witnesses the memorial a chance to learn something about the people who perished and the family members who continue mourn the loss of their loved ones. The lives lost on September 11, 2001 and February 26, 1993 collectively form the foundation of two memorial gardens rising from where the WTC towers once stood. Each victim is manifested as a symbol of strength, a single column helping support one of two island gardens. As the columns extend through the garden surface at varied heights they transform from concrete into glass. Each unique glass column is a timeline of a victim's defining moments beginning with a birth date and culminating at September 11, 2001 and February 26, 1993. It is an object biography that gives visitors a glimpse of the persons who perished on both days. By sharing the victim's birth date and life story, it enables visitors to relate and form a personal bond which otherwise would not have existed. The memorial column becomes a glowing beacon of each victim; their defining moments shining brightest at night. In passing between the ever-changing gardens, the visitor is made aware of two other tragic events bridged in time; Somerset County, Pennsylvania and Arlington, Virginia. The memorial bridge is composed of alternating bands of stone and glass, epitomizing the past and the present, the enduring and the ever changing. The name of each victim from Pennsylvania and Virginia is etched into a glass plaque suspended over a pool of reflected azure. Upon entering the North garden, visitors are greeted with a natural stone wall inlaid with 2982 randomly protruding polished squares. This wall spans the length of the island, shielding it from its frenetic surroundings. Water trickles from an opening at the base of each square into a pristine reflecting pool. 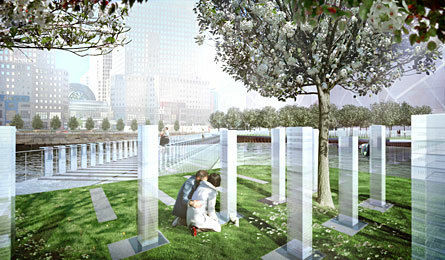 The Pool of Tears enfolds the entire memorial site forever preserving Ground Zero as hallowed ground. The expanse of this pool is a metaphor of the collective tears shed by millions around the world. The memorials become the embodiment of each victim representing them as a summation of time; a collection of moments recorded in each life. Together they form a place of hope and tranquil beauty suspended in a sea of calming motion."